Monrovia, CA (November 5, 2015) – CODA Energy announced today that it has been selected as a finalist in this year’s Fierce Innovation Awards: Energy Edition, a utility-reviewed awards program from the publishers of FierceEnergy and Smart Grid News. 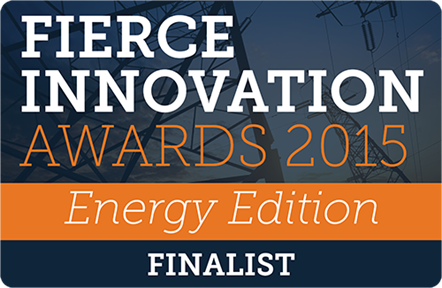 CODA Energy has been recognized as a leader in the category of Energy Storage for its innovative, industry leading commercial product, the CODA Core™ Energy Storage System (ESS). Finalists’ applications were reviewed by an exclusive panel of executives from major North American utilities including CenterPoint Energy, Duke Energy, Ameren Corporation, San Diego Gas & Electric, Iberdrola USA, Commonwealth Edison, and PECO. All applications were evaluated based on the following categories: technology innovation, financial impact, market validation, compatibility with existing networks, end-user customer experience, and overall level of innovation. CODA’s energy storage hardware and software is designed for behind-the-meter, commercial customers and easily pairs with commercially available power conversion technologies. Real-time energy insights from CODA’s proprietary peak shaving algorithm help businesses reduce peak electricity demand, dramatically lowering monthly electricity costs in states like California. CODA’s technology platform is UL Listed for safety and performance. In the last 18 months, CODA has deployed over 3MW of distributed commercial peak shaving systems in California and launched pilot projects that demonstrate the wide range of energy storage applications in five other states. Energy: FierceEnergy; SmartGridNews.com; FierceWater Telecom: FierceWireless; FierceCable; FierceDeveloper; FierceOnlineVideo; FierceTelecom; FierceWirelessTech; FierceWireless:Europe /TelecomsEMEA, FierceInstaller; an Telecom Asia; Healthcare: FierceEMR; FierceHealthcare; FierceHealthFinance; FierceHealthIT; FierceHealthPayer; FierceHealthPayerAntiFraud; FierceMobileHealthcare; FiercePracticeManagement and Hospital Impact; Life Sciences: FierceBiotech; FierceBiotechIT; FierceBiotech Research; FierceCRO; FierceDiagnostics, FierceDrugDelivery; FierceMedicalDevices; FiercePharma; FiercePharmaAsia; FiercePharmaMarketing; FiercePharmaManufacturing; FierceVaccines and FierceAnimalHealth Enterprise IT: FierceBigData; FierceCIO; FierceContentManagement; FierceDevOps; FierceEnterpriseCommunications; FierceITSecurity and FierceMobileIT; Finance: FierceCFO; and FierceFinanceIT; Government: FierceGovernment; FierceGovernmentIT; FierceHomelandSecurity; FierceMobileGovernment; FierceCities and FierceGovHealthIT Marketing & Retail: FierceCMO; FierceMobileMarketer; FierceMobileRetail; FierceRetail; and FierceRetailIT. Headquartered in Monrovia, CA, CODA Energy designs and builds scalable, UL listed commercial and industrial energy storage solutions to support a smarter, cleaner, and more reliable grid. The presently available CODA Core™ product combines advanced lithium-ion cells with proven battery and temperature management systems and an integrated operating system designed to meet growing energy needs – including peak shaving, demand response and ancillary services. CODA Energy’s products reduce electricity costs, control energy consumption and manage energy risk, optimizing commercial and industrial energy operations for scalability, extensibility, safety, reliability and security; ultimately contributing to a more economically and energy resilient world.